Oh captain, my captain, my captain, my captain, my captain. Monitor Mates of Kirk, Picard, Sisko, Janeway and Archer in one set! The commanding officers from Star Trek: The Original Series, The Next Generation, Deep Space Nine, Voyager and, Enterprise. Miniature bobble heads stick to the top of your computer monitor or LCD! Entertainment Earth Convention Exclusive! Five captains are better than one with this incredible Star Trek The Captains Monitor Mate Bobble Heads Set of 5 - Convention Exclusive made exclusively by Bif Bang Pow! as an Entertainment Earth convention exclusive! Now collectors can use their monitor to proudly display all five of Starfleets most prominent commanding officers from Star Trek: The Original Series, The Next Generation, Deep Space Nine, Voyager, and, Enterprise. 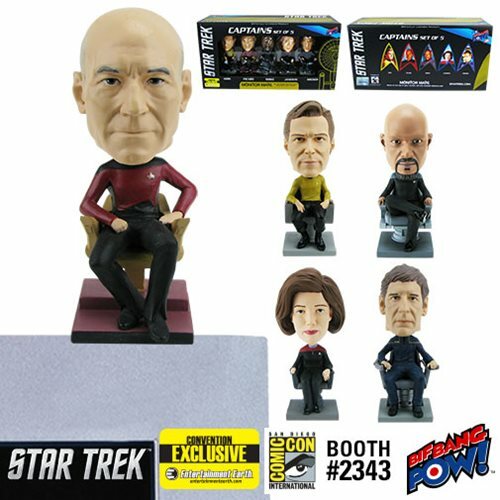 Each 4-inch scale miniature resin bobble head figure showcases a captain with their ship specific captain's chair that can attach to a computer monitor or flat surface via a non-damaging adhesive pad on the base. Set your monitor to stunning with this individually numbered and limited edition of 1,000 pieces which you simply can't afford to miss! Prototyping by 3D Systems and Gentle Giant. Ages 14 and up.